If you’re interested in getting an ad supporting my Hill Country Happenings articles or even sponsoring the cover, contact Monica at 830-377-8707. It’s a happening magazine celebrating a decade of publication! Last month was a pretty good month for me. It was very welcomed after a challenging recovery period following my accident last November. February started with the Super Bowl and I found myself among the few not rooting for Peyton Manning and the Broncos. The disappointment was still too fresh from Denver uprooting my New England Patriots two weeks prior. In addition, I still harbored a grudge against Denver for beating my other team, the Steelers, in a 2012 Wild-Card playoff game with one overtime play by Tim Tebow. However, wounded pride was not only the reason to be a Seattle fan. In my Fantasy Football league, I had the Seahawks Quarterback, Russell Wilson, and I needed a good game from him to possibly win in my league. For you regular readers of this column, you may remember back to last year’s October column when I discussed starting the season already stinking out the house by losing every game, most by five points or less. Many might have given up, but I didn’t as my last cellar season was in 2010 when I ended up winning the post-season with Aaron Rodgers as my Quarterback. Talk about the planets being aligned!!! I was going into the Super Bowl with a lead in our league and providing Wilson had a good game and Marshawn Lynch not having a monster game, it looked promising for me to win. The phone rang a few hours before game time. I’m playing Spades on the computer and half watching the pre-game. The caller is the Commish of our league. “Hey, did you see Russell Wilson hit his head getting off the team bus? It’s really bad,” he claims. Well, he had me going for several minutes until I saw Russell safely in the locker room area. Seattle won, Wilson had a good game and I waited on pins and needles for a week until my league win was confirmed. Did you notice the commercials for the Super Bowl this year? The most talked about ones seemed to have patriotic or animal themes. My personal favorites were the ones from Budweiser. The first one was the puppy in a stable bonding with a Clydesdale, then getting adopted and therefore separated from the horse. The duo was later reunited when the pup escaped from its owner and returned to the horse farm. All this in one minute — sure moved along a lot faster than my soap opera! The second one was the town welcoming home the soldier. One couldn’t help but get teary-eyed as the community thanked their hero returning from the war. I also cracked up at the Subaru commercial with the retriever family. Papa dog was caught by mama dog ogling a poodle crossing the street and done in front of a puppy in the backseat with his puppy-sibling in the infant-seat. Mama dog growls! Loved it….. Then came an even better one by United Airlines during the Olympics. It had the US teams bobsledding, skating and skiing through the airport, jetway and airplane. As the athletes got situated, the curling stone jammed in the Captain’s foot and a female skater did a three-sixty as she stowed her bag in the overhead compartment. I just loved the creativity put into making those commercials. Speaking of the Olympics, as of deadline time for this column, they were still in full swing. We’re very excited as Rick’s cousin’s son-in-law, Dallas Robinson, is on the US Bobsled team. We’re so proud of Dallas as well as all the Olympians who have spent years of training and hard work to represent their respective countries. So far, it has been a media frenzy with several non-games sagas unfurling. 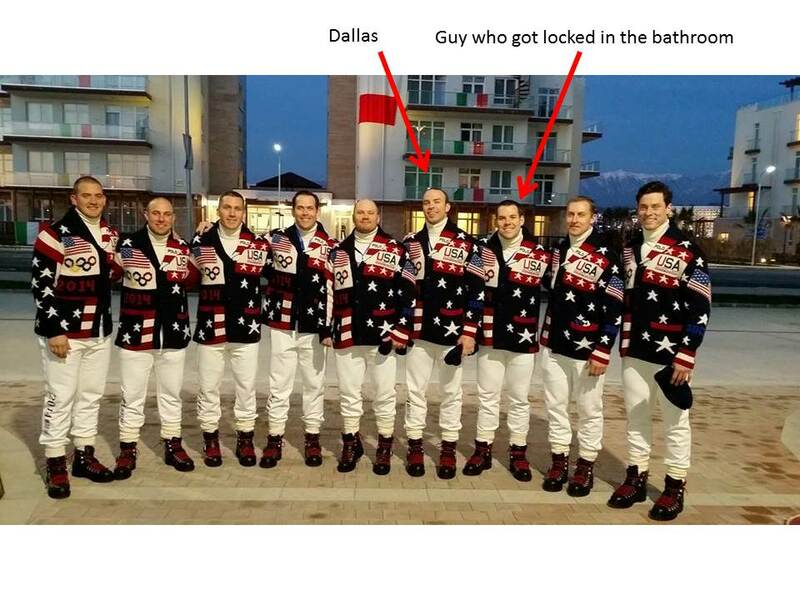 Unless one was a bobsled groupie, few had heard of Johnny Quinn — that is until he got locked in his bathroom and stuck in an elevator. We also witnessed how nasty conjunctivitis can be as poor Bob Costas battled the disease as it spread to both eyes. Been there, done that. On a positive note, I loved his round spectacles. My heartstrings were tugged as I saw US slopestyle skier Gus Kenworthy trying to foster several puppies. Good thing I wasn’t over there. Those cuddly little fur balls are irresistible! While the hype built up over a rematch of USA and Russia in hockey, I fondly thought back to the 1980 “Miracle on Ice” at Lake Placid. I remembered it well, as I viewed it from my parents’ recliner with crutches at my side. I was recovering from a skiing accident. Here I was in 2014, again in rehabilitation of several body parts, watching the Olympics. The Olympics served as a catalyst for my determination to be fully functional again. So many of the participants had overcome surgeries and rehabilitations to be a part of the experience. My orthopedic surgeon, Dr. Lue, was happy with my progress rehabilitating my elbow, wrist, hand and shoulder. He was pleased that I was ahead of what he expected for that stage of my recovery. I was thrilled to see one of the skiers back racing after recovering from an accident less than a year ago. I commented that’s there’s hope for me after all! Rick was kind enough to point out that she is also forty-seven years younger than me. Minor details. A “Lefty Handshake” as Dr. Lue works my left hand.